For ages, we didn’t think much about the batteries in our motorcycles. When you only have one option, the traditional lead-acid battery, there’s not a lot to think about. As long as it cranks the starter over and fires up the bike, you’re good. If not, time to shell out for a new one. But like all components on a motorcycle, eventually, new technology emerges to improve the breed. The battery is no different. With the emergence of lithium batteries the consumer now has more options. To the average consumer, a battery is a battery. What separates one from the other? For starters, the internal chemistry is very different between the two, but for the purposes of this guide we’ll stick to the practical differences. Generally speaking, lithium’s biggest advantage is its drastically reduced weight and physically smaller size compared to lead-acid. Lithium also has a significantly lower discharge rate – the amount of charge lost simply sitting – compared to lead-acid, faster recharge rate, more cranking amps (compared to a similar lead-acid application), and safer handling due to its internal chemistry not featuring lead and, yes, you guessed it… acid. The tradeoff, of course, is a significantly higher price tag. Despite this, there’s nothing wrong with lead-acid batteries, and if you’re looking for the lightest hit on your wallet to power your motorcycle, then by all means. However, if you’re looking for a performance edge and value slicing weight wherever possible, then read on as we highlight eight different companies in the lithium battery game. 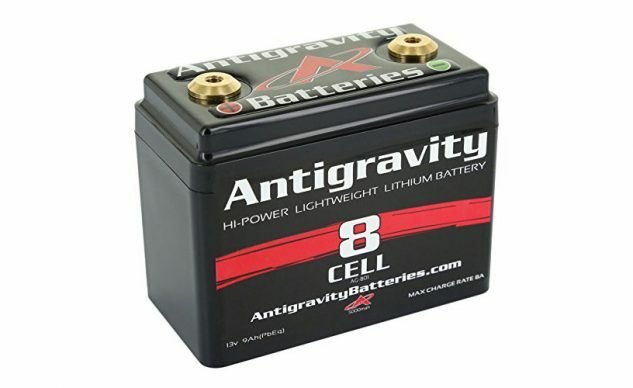 Antigravity has become one of the most recognized names in the lithium battery world, as it has products in a wide array of industries, not just powersports. Built in the USA, Antigravity batteries feature an all-brass terminal design, can be installed in any orientation, and in the case of the AG-801 seen here, weighs only 1.5 pounds. Antigravity says its batteries can hold a charge for up to one year, provided there is no parasitic draw while the bike is off (alarms, GPS, heated grips, etc.). Because the batteries are physically smaller than comparable lead-acid types, Antigravity batteries come with adhesive-backed foam strips to fill in the gap in your battery box. The AG-801 is rated at 240 cranking amps and 9 Ah, but there are several different varieties to choose from for your specific application. 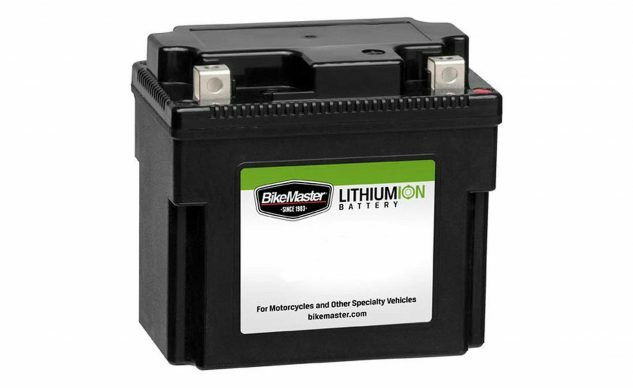 Search the BikeMaster site for the appropriate battery for your application. If there’s an electrical component on your motorcycle, chances are Bosch had something to do with it. 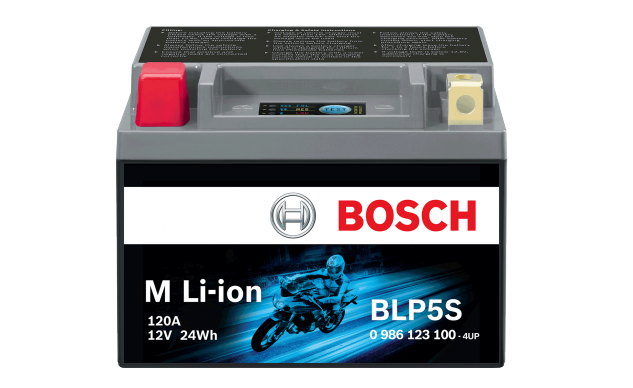 So it only seems right that Bosch also has its own line of lithium-ion batteries. Like the other batteries here, its lithium chemistry means there are no poisonous lead or acid components. 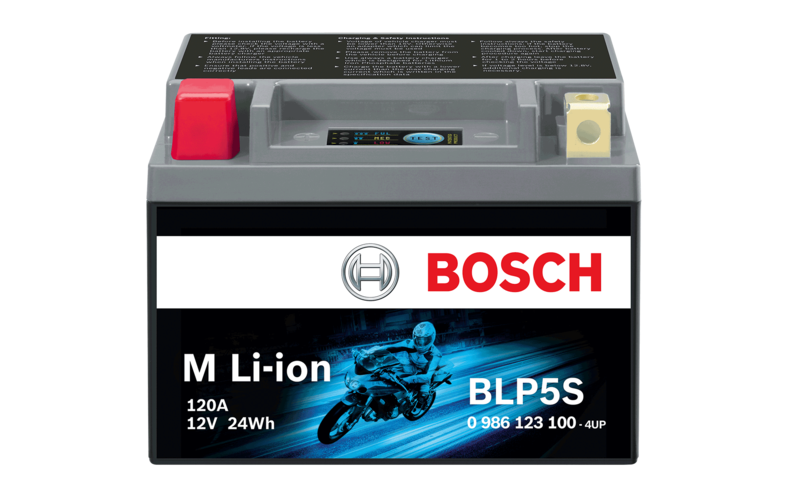 The battery lid on the Bosch batteries features a voltage tester and Battery Management System, the latter balancing the voltage level among the cells when charging or discharging. The voltage tester works in conjunction with the charge-status display to tell you how healthy (or unhealthy) your battery is. You can find more information about the four available sizes at the Bosch website. Braille’s line of Green Lite lithium batteries started as a replacement for sub-1100cc motorcycle batteries, but soon scaled up to include applications for big V-Twins, cars, trucks, and even marine equipment (with a special water-resistant sealing). The benefits are the same as the rest fo the batteries here – lighter weight, less maintenance, higher voltage, quicker recharge rate, etc. However, for those who don’t want to stuff foam in their battery boxes to compensate for the smaller battery, Braille also produces OE direct replacement sizing. 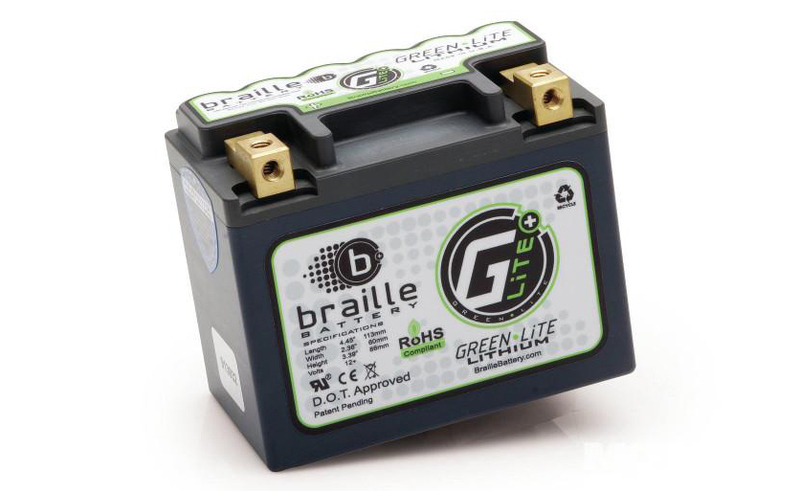 Visit the Braille Battery website for more info on the G5, and the rest of the Braille line. * IPT Battery Management System (BMS) – Every Pulse IPT battery comes with an integrated BMS which controls the function and behavior of the battery. This means better performance, longer life, and emergency start capability. * Universal Charger Capability – Most commercially available battery chargers work with the Pulse IPT batteries. * V Direct Multi Terminal – Our solid copper terminals have 4 threaded mount holes. Attach your accessory wires without having to use long screws on one small terminal. * V Sleeve Silicon Terminal Covers – Color coded for polarity, our silicon terminal covers protect against short circuits. Click here the link above to purchase or learn more about the Pulse IPT Battery. Moty batteries are a little different than the rest due to their casings being essentially shrink-wrapped around the cylindrical cells, giving a unique look that also helps reduce weight. Available in 4-, 8-, 12-, and 16-cell batteries for various applications and engine sizes, all but the 16-cell are available with either traditional or quick-release connectors. The 12-cell shown above is an example of the latter, where leads attach to the existing terminal posts on the motorcycle and the supplied heat shrink is then applied around it. 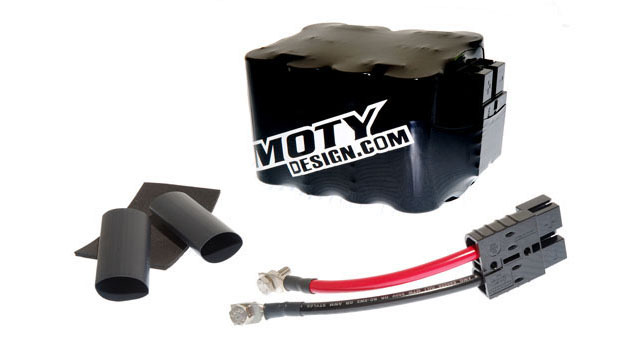 A quick-disconnect coupler then connects to the battery, so when the motorcycle is not in use, simply unplug the connector and Moty says the battery will be good for up to a year. The 4-cell batteries are ideal for Singles needing less than 120A, while the 16-cell can handle even the biggest of V-Twins. Find out more on the Moty Designs website. 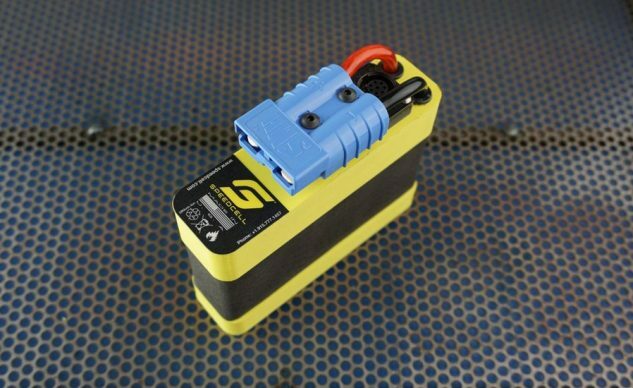 Moty isn’t the only battery company in the quick disconnect game – the SpeedCell Legacy battery also features quick disconnect and is the battery used by many MotoAmerica teams. The primary reason is because, in the case of the Legacy 2.5Ah version, it’s incredibly tiny and light. SpeedCell says the 2.5Ah measures 4.7 in x 1.3 in x 3.3 in and weighs under one pound (0.912 pounds, to be exact)! Meanwhile, the company says peak amperage capabilities exceed twice that of its nearest competitor, with a 68% faster recovery rate. In addition, all Speedcell batteries come equipped with a multi-function expansion port integrated into the battery housing. This expansion port is capable of providing not only a charge/diagnostic interface but also up to three additional 12V circuits, each capable of providing 3A of current. Giving the end user a Plug-N-Play circuit expansion. 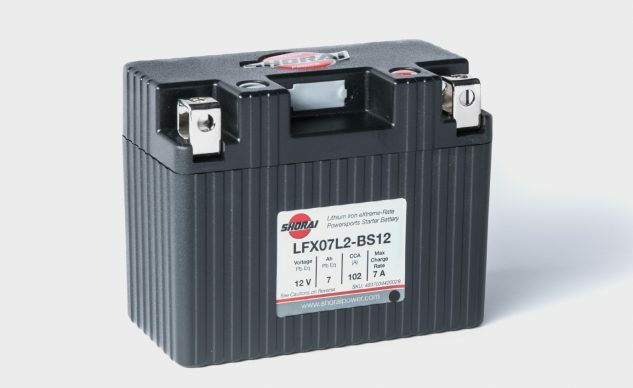 Shorai has been in the motorcycle battery business since 2010. In that time the company has gone from relatively obscure, to a major player in the battery biz. In fact, our own John Burns, and former E-i-C Kevin Duke, put one in their own Yamaha R1 and Ducati 900SS, respectively, and had mostly nice things to say. Like nearly all the batteries here, Shorai has a complete line to fit whatever motorcycle is in your garage. Using the $99.95 LFX07 shown here as an example, it measures 4.45in. x 2.28in. x 3.50in, weighs 0.97lbs., and provides 102 cold cranking amps. 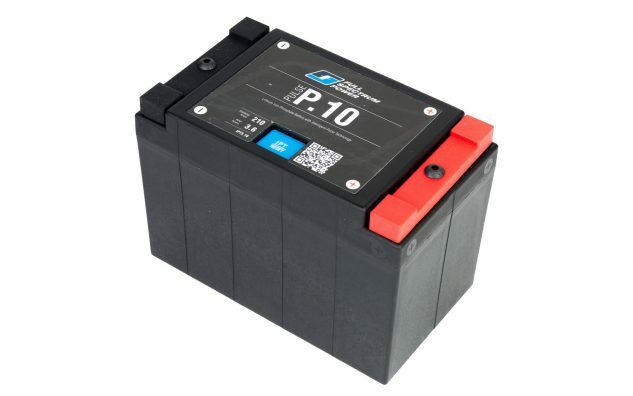 Western Power Sports is better known as a distributor for many of the powersports products we know and love, but did you know the company also has a line of private label lithium batteries, too? 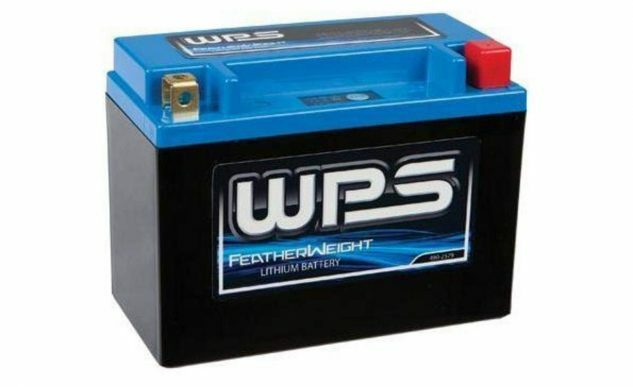 As you can see in the image above, the batteries are called Featherweight, and with a name like that it better deliver. WPS says its 6.2 in. x 2.8 in. x 4.6 in. battery comes in at 1.7 lb. But what makes the WPS battery different from the rest is its on-board LED test gauge that will indicate the battery’s charge at the push of a button. It’s not quite as helpful as, say, the Pulse IPT battery that will leave enough juice for you to start your motorcycle, but it’s still a nice feature. The post Lithium Battery Buyer’s Guide appeared first on Motorcycle.com.